In the Audio Settings dialog, on input tab, the "volume meter" display for showing input level is not correctly redrawn when changing devices: if the change leads to a slight relayout of the dialog, the old volume meter is still displayed. Minimizing and restoring the window removes the old volume meter display. 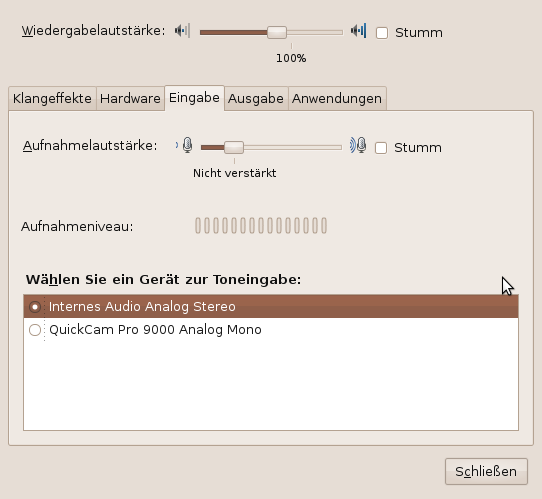 Attached is a screenshot showing the dialog after switching to QuickCam Pro 9000 microphone. Apparently the webcam doesn't have an "Unamplified" setting while the internal micropone does, so the lower part of the dialog is moved up. This is on up-to-date Karmic installation. IMHO this is a very minor problem. For completeness here's a screenshot of the dialog before switching input devices.